Homemade hot chocolate – delicious and simple recipe. It tastes amazing and I hope it will be your favorite thing to drink on a cold day. You can use baking chocolate, milk or dark. Combine chocolate and milk in a heavy saucepan. Stir over medium heat. Reduce heat when bubbles form, and continuously stir with whisk. Continue whisking over low heat until all chocolate melts and is well blended. Raise heat to medium and stir. When it begins to boil, remove from heat. Now stir in vanilla. Carefully pour into 3 or 4 cups. 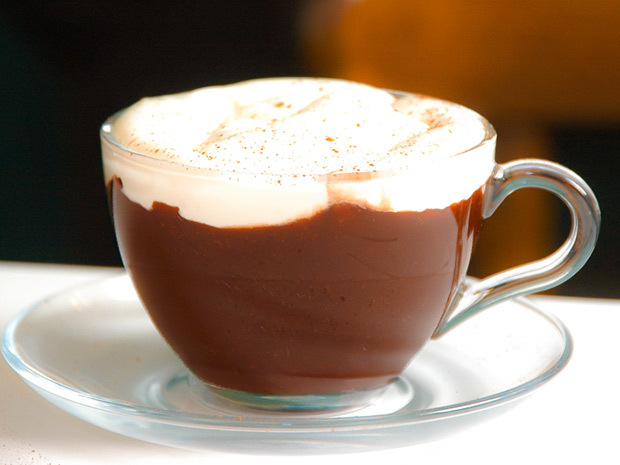 Top each cup with whipped cream and sprinkle with cocoa powder. Enjoy!